Hello, Nexites, and welcome to a new edition of Deck of the Week. The recent Modern meta has continuously shifted from fair decks, to combo decks, to big-mana decks. It says a lot about the diversity of the format, regardless of how other people think about the Top 8 decks at Grand Prix Oklahoma. With all these in mind, it might be time to shift back to an existing archetype that flourishes in a field like this, as it has all the tools to take out contenders from all corners of Modern. I’m talking about Blue Moon. Blue Moon has been ticking up in popularity in the metagame standings, and recently it took down an Magic Online PTQ in the hands of MTGO user Rooney56. To begin, let’s take a look at his list. Blue Moon is a deck that has experienced a ton of variation over the years, most notably in its win conditions. Through the Breach plus Emrakul, the Aeons Torn is the newest addition to this arsenal. The new face of Blue Moon bears much resemblance to Splinter Twin decks of old (some versions are even running the Kiki-Jiki, Mirror Breaker kill themselves). Rooney56’s build is a classic combo-control deck. It’s packed with tons of interaction in removal and counterspells, which is augmented by the always reliable power of Blood Moon to restrict your opponent’s movements by disrupting their mana base. These controlling elements let you polish your hand until you can breach in an Emrakul for the win. Finally, the old Bolt-Snap-Bolt alternate wincon is on full display here too. The list runs nine copies of permission spells that are made more potent by the presence of Snapcaster Mage. It also has the usual cantrips of a blue deck, Opt and Serum Visions, which help fix your hand and set up your lethal two-card combo. Noticeably missing in this list’s disruption package is Spreading Seas, which has been cut in favor of more redundancy in the other cards. There’s also a singleton Vendilion Clique that provides additional utility and much needed information before you decide to go in on a Through the Breach. The deck’s sideboard packs the Platinum Emperion plus Madcap Experiment package, which gives you an additional angle of attack besides Through the Breach and Emrakul. Favorable matchups such as Tron and Eldrazi decks are made better with access to Abrade and Disdainful Stroke. Meanwhile, Izzet Staticaster and Anger of the Gods are very good against Affinity and Humans, the premier aggro decks of the format right now. There isn’t much that’s new in this build, but blue seems well placed in the meta right now. 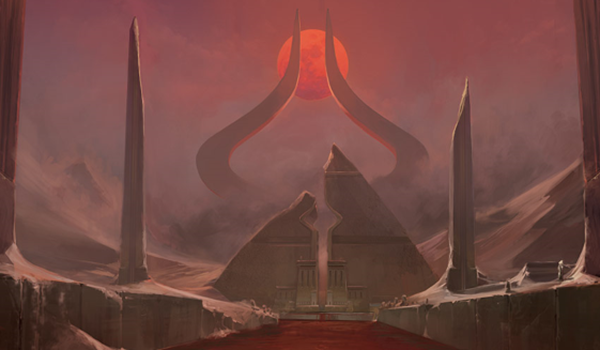 Blood Moon is the perfect compliment to this control-esque approach, and Emrakul, the Aeons Torn is an excellent finisher that can steal games in an instant. Blue Moon might just be one of the best decks to bring right now to any Modern tournament!